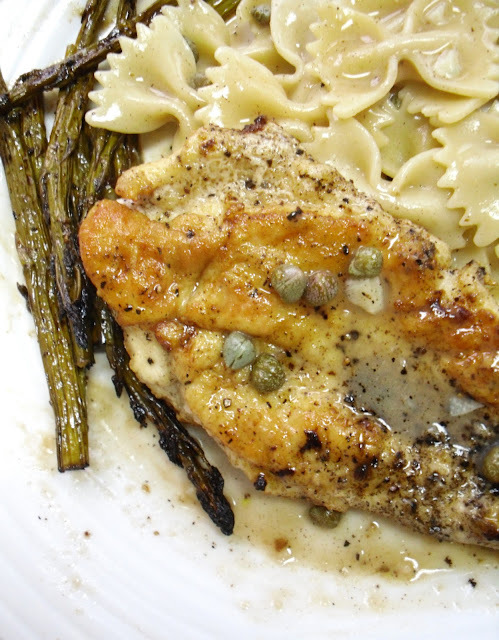 Chicken Piccata, a lemon-garlic Italian chicken specialty, is one of my favorite dishes. However, I don't get an opportunity to cook it often, as my husband particularly dislikes lemon-y chicken and even more so capers, so I waited until I was home alone and indulged. When I was in college, chicken piccata was one of the first things I learned how to cook for myself that wasn't from a box. I partnered this dish with asparagus, because it is in season and complements nicely with lemon flavors. So in this posting, you'll be getting 2 delicious recipes: Chicken Piccata and roasted balsamic asparagus. Enjoy! Chicken Piccata is very agreeable and will pair well with most dry or semi-dry white wines. I love a buttery Chardonnay with the lemon and garlic flavors of this dish. 1. Trim 1 inch off end of aspargus. Combine asparagus, olive oil, and balsamic vinegar in a resealable plastic bag. Sprinkle with about 1 tsp salt and 1 tsp freshly cracked pepper. Shake to combine and allow to marinate for at least 20 minutes. 3. Butterfly 2 chicken breasts and cut in half so there are 4 thin cutlets. Pound cutlets to ¼ thickness. Dredge cutlets in flour, season with salt & pepper. Add remaining flour to chicken broth and whisk to combine, set aside. 4. Once asparagus marinated and oven preheated, place asparagus in single layer on cookie sheet and bake for 10-15 minutes. Cooking times will vary depending on thickness of asparagus spears. Asparagus should be tender, but not stringy. Sprinkle 1/4 cup parmesan cheese on top of aspargus. Broil for 2 minutes in oven. Remove and set aside. 5. Meanwhile, melt butter and warm olive oil in large skillet over medium-high heat. Cook chicken cutlets until browned, about 2-3 minutes on each side. Set chicken aside. 6. Add garlic to pan and deglaze with wine. Bring wine to boil and allow to cook down for 1-2 minutes, then add lemon juice and broth/flour. Season with salt. Allow sauce to thicken, about 5 minutes. Stir in parsley and capers. Add pasta and stir. Serve with chicken and asparagus. How much garlic do you use? How much butter? Not listed in the ingredients. :o I do agree with your choice of farfalle!